The book "Pétanque-training and technique" ! While I hope this book will appeal to beginners, it's really aimed at players wishing to develop their game. This book countains the fruits of several years thinking about technique, tactics and psychology. I threat these subjects seriously and in depth but with a certain (in French) humour. I hope you will find the book both instructive and enjoyable. I've given you all my winning secrets-I hope you will make good use of them! If the book is a present and you would like a dedication, please write the name and any message in the Enquiries Area below. I started playing pétanque towards the end of the 1980s. Straight away I caught the virus and I played seriously during five ears. During that time, I reached the Départmental final four times. After stopping for thirteen years, I again took up my favourite sport in 2010. 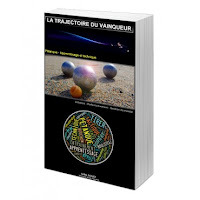 One year later, I launched my website www.petanque-apprentissage.com and not long after, my first book (in French). In 2014 & 2015, having applied my own training methods, I won three Départmental titles and finally partipated in the French Championships. This second volume is the final result of all my work and thoughts. 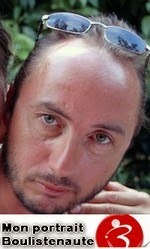 Above all, it's the passion and the pleausure of sharing that motivates me. Click on the book to read the summary and the first pages ! Way more than a simple petanque book! The author Gilles Souef has found a really nice way to share all his years of hard work and dedication to this fantastic sport. If you're simply a beginner or even playing at an advanced level, this book will give you a deep insight into the sport and stress all the aspects of yourself that can be improved. According to the author, everything begins with a good technique which is the first step towards achieving your goal when throwing a ball. Each body part and its function is analysed and you'll be able work step by step on your improvement while reaching a new comfort zone. On the strategy, you'll discover how to place the odds on your side during a game, taking in account the various parameters such as for instance the opponents, your daily level, the type of surface... Winning at petanque is way more than simply throwing a ball. Finally, a great part of the book is dedicated to the mental strength of the game. How many time do we feel playing under our real level during competition? Or how many time could a single ball have been changing the course of the entire game? With a good step by step mental preparation as well as intelligent training the author helps you to boost your confidence so as to reach your personal best and even go far beyond. 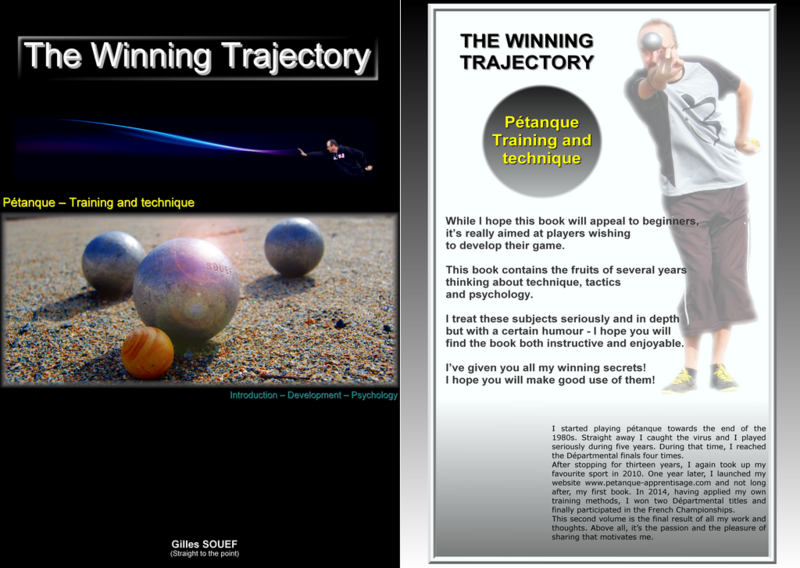 On top of his incredible petanque skills and numerous titles at the highest level, Gilles Souef, has a good sense of humour and a fantastic approach of the sport which makes the book easy to read and a milestone in your journey! It has been a pleasure to learn from you! I have been asked to review this book and to be honest. So I will. The book is basically a collection of blog posts. A very generous and diplomatic reviewer would describe the tone of the book as "chatty and readable". Personally, I would say that the book rambles endlessly without providing any useful information or advice. If you were to remove all of the verbose off-topic chit-chat, the small amount of text remaining (text that actually discusses petanque) essentially adds up to a single platitude -- "Practice! If you practice you will get better!" There were a number of topics for which I seriously wanted help and advice (e.g. on the subject of how to improve my shooting). On each of those topics, what I invariably found was random stream-of-consciousness ramblings, stupid attempts to be funny, useless platitudes, and a flippant refusal to approach the subject seriously. It was as if the author was treating the entire book as a joke. He is trying to be amusing, of course. He succeeds only in being irritating. The book contains many suggestive/sexual references to the author's wife. Perhaps French readers find these little asides amusing. I found them tasteless and pointless. The light, chatty tone of this book was not to my taste. But tastes differ, and you may like it more than I did. This book was not worth the money I spent to buy it, nor the time I spent to read it. After I read it, I threw it away. The translation by Raymond Ager does a good job of reproducing, in English, the flavor of the French original. Perhaps there will be others ? As a beginner, I have found this book a tremendous help, and I'm sure I'll appreciate its value further as my game continues to progress. No nonsense, Gilles 'cuts to the chase' - as Gilles himself would say, "Straight to the Point". I have recommended this book to others, and will do so again. One or two typographical errors (as a proof reader, I tend to look out for this sort of thing! ), but these in no way detract from the priceless content. Merci, bonheur et bonne santé Gilles! Bonheur et santé également : le plus important ! In reply to Stephen Ferg's comments: firstly, I'm the translator - I'm glad you appreciate the translation. I'm sorry - and a bit surprised - if you didn't find anything to help your technique. Personally, I found a lot that helped me personally and that was the main reason that inspired me to translate the book. True, the humour was difficult to translate and I knew there was a risk that it wouldn't be to everybody's taste. I guess that's always the problem with humour - some appreciate it, others don't. I hope you continue trying to imrove - that's the key purpose of the book. Don't just throw it away and give up.